Tradical® Hemcrete® is a bio-composite building material made from hemp shiv (the woody core of industrial hemp) and a lime based binder called Tradical® HB. Tradical® Hemcrete® is sold in the US by American Lime Technology. Recent research has shown that the dynamic performance of Tradical® Hemcrete® is even better than previously thought once it is fully dry. 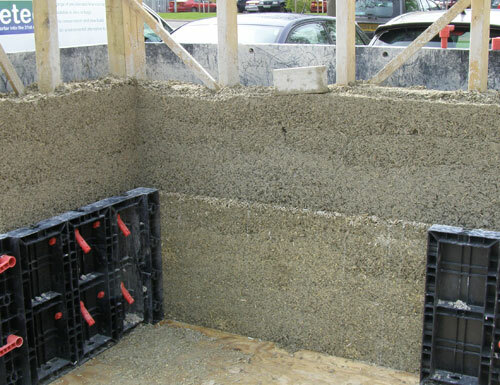 However, the drying of Tradical® Hemcrete® is dependent on job site weather conditions. In order to overcome this, we have recently launched off-site building systems where the Tradical® Hemcrete® in the factory made panels is dried BEFORE it is delivered to site. Tradical® Hemcrete® is normally used to create the walls of new buildings, but can also be used in the refurbishment of existing buildings. Tradical® Hemcrete® has a unique combination of insulation and thermal inertia and these properties combine to create building with very stable internal environments that need very little heating or cooling (if appropriately designed and constructed). Hembuild®: A structural walling system for low-rise buildings. Hemclad®: A cladding system for large-scale building with a primary structural frame. Will building occur between the beginning of March and the end of July (in climates where freezing temperatures are common)? Is the construction schedule relaxed (e.g. self-build projects)? Does the construction schedule severely penalize time and cost overruns? Does construction take place all year round? Are on-site access time frame critical?